The market for Sam Gilliam's, NA work is stronger than ever. Just don't call it a comeback. Installation view of "Sam Gilliam : 1967–1973 at Mnuchin Gallery. Photography Tom Powel Imaging. Artwork © Sam Gilliam. Whatever you call it, Gilliam has been enjoying an unprecedented level of attention in recent years. The 85-year-old artist represented the US at the Venice Biennale way back in 1972; he was the first African American artist to do so. But his market has been slow to catch up—until now. “This is his greatest renaissance yet,” says Jonathan Binstock, who organized Gilliam’s retrospective at the Corcoran Gallery of Art over a decade ago. “He’s had a couple of them at the very least.” Binstock is currently preparing another major Gilliam show, “The Music of Color,” at the Kunstmuseum Basel, scheduled to open ahead of Art Basel in June. Eleven of Gilliam’s top 20 auction results were set in 2017. All of them have been set since 2013. And the three highest auction prices ever paid for his work came in quick succession this past fall. His current record is $684,500 for Rays (1971), a large acrylic on canvas that smashed its presale estimate of $100,000–150,000 at Sotheby’s in late September. Nevertheless, Gilliam’s auction prices still lag behind many of his peers (who, not coincidentally, happen to be white). Fellow Washington Color School painter Morris Louis’s auction record is $3.6 million; Kenneth Noland‘s is $3.3 million. The Central Pavilion, with a work by Sam Gilliam. Image: Ben Davis. If it feels like you’ve been seeing Gilliam’s work everywhere lately, it’s because you have been. Forty-five years after Gilliam first represented the US at the Venice Biennale, he returned to the city this past summer. His brilliantly colored unstretched canvas Yves Klein Blue (2017) exuberantly welcomed visitors to Giardini’s main pavilion. In 2016, a major new commission, Yet I Do Marvel, was hung in the lobby of the highly anticipated National Museum of African American History and Culture in his hometown of Washington, DC. In London, Gilliam’s work figured prominently in the Tate Modern exhibition “Soul of a Nation: Art in the Age of Black Power” (which opens at the Crystal Bridges Museum in Arkansas next month) and in Pace Gallery‘s recent group show of Washington Color School painters. Meanwhile, in New York, Mnuchin Gallery mounted a presentation of his early paintings from 1967 to 1973. Surprisingly, it was the artist’s first solo show in the city for more than three decades. 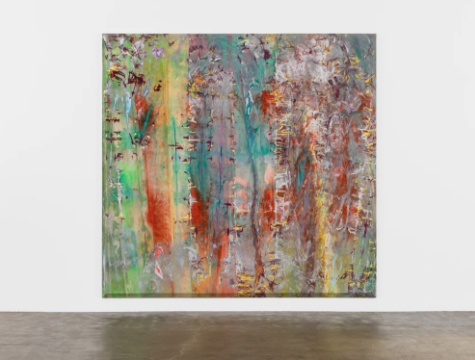 Sam Gilliam, Idylls I (1970) sold for $370,000 at Freeman’s in Philadelphia last month. Photo by Thomas Clark, Courtesy Freeman’s, Philadelphia. Gilliam’s late-breaking commercial success comes despite—or perhaps because—he eschewed a conventional path for most of his life. Indeed, for years, Gilliam showed only with smaller galleries: Marsha Mateyka in Washington, DC, and the now-shuttered Galerie Darthea Speyer in Paris. (It was, of course, also harder for a black artist to get major gallery representation.) But things began to shift four and a half years ago, when Gilliam had his first show with Los Angeles power dealer David Kordansky. Sam Gilliam, Green Web (1967). Smithsonian American Art Museum, Gift of the Woodward Foundation. The gallerist was introduced to Gilliam through the contemporary art star Rashid Johnson, who organized a show of his work at the gallery in 2013. It was quickly followed by solo presentations at Frieze New York (2014) and Frieze Masters (2015), another show at the gallery (2016), and an accompanying monograph (2017). Yet another solo show is on the schedule for 2018. Prices for classic drape or beveled edge paintings from the late ’60s and early ’70s—Gilliam’s most sought-after work—can be significantly higher on the private market, ranging from $350,000 to just shy of $1 million, sources say. Nigel Freeman, the director of the African American fine art department at Swann Galleries in New York, agrees that the market for Gilliam is “at an all-time high” following an acceleration over the past two years. But some believe the work is still undervalued, particularly “when you consider how seminal some of the 1960s and ’70s paintings are,” McCord says. He notes that Gilliam’s auction prices have consistently outperformed relatively conservative estimates, a sign that the market is still finding its footing. Indeed, Gilliam’s current record of $684,500 was more than four-and-a-half times its high estimate. His second- and third-highest prices, also achieved this past fall, vastly eclipsed expectations too. A 1970 drape painting, which sold for $370,000 at Freeman’s Philadelphia, was estimated to sell for a mere $50,000–80,000, while a 1970 abstract painting sold for $332,400 at Weschler’s in Maryland, more than double its low estimate of $150,000. 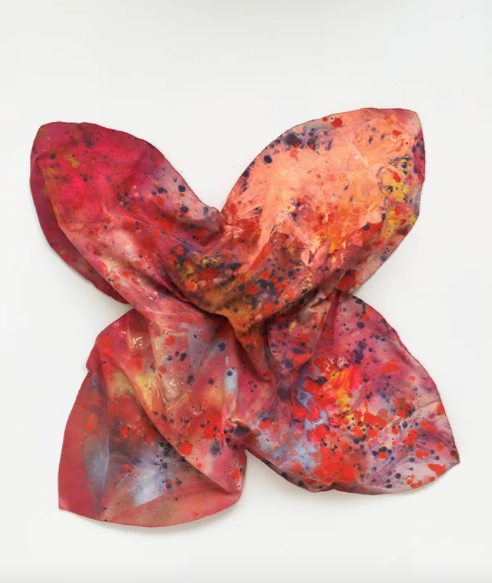 Sam Gilliam, Not Spinning (2001-04) The work sold on October 5 for $57,500 at Swann. The artnet Price Database lists 400 auction results for Gilliam. Of these 326, or nearly 82 percent were sold. The lowest price listed is $100 for a 1974 print sold at Leslie Hindman in 1993. Gilliam first rose to fame in the late 1960s with his drape paintings, which came out of his experiments with unsupported canvases. He said the works were partly inspired by watching women hang laundry on clotheslines from his studio window in Washington, DC. He began to drape and suspend large paint-stained canvases, imparting an innovative sculptural element to the works. “These are perceived to be his biggest contribution to the history of art because they took painting off the wall and off the stretcher,” says Rajaratnam of Mnuchin. The other particularly sought-after body of work is Gilliam’s “beveled-edge” or “slice” paintings, which he began creating in 1967. The works’ edges extend off the wall and toward the viewer. Sam Gilliam, Idle Twist(1972). Courtesy of Tom Powel Imaging. © 1972 Sam Gilliam. Both series “highlight his interest in pushing the traditional boundaries of painting and creating innovative works that alter our perception of the picture plane,” says Dunham Townend, head of the modern and contemporary art department at Freeman’s, where the $370,000 drape painting sold last month. Rajaratnam notes that Gilliam has been influential to younger artists who similarly blur painting and sculpture, from David Hammons to Oscar Murillo. “People are only now realizing the huge debt that is owed to Gilliam,” she says. Museums that had moved their Gilliam paintings into storage are now organizing shows around them, he says. And institutions that did not own major examples spanning his entire oeuvre—including the Museum of Contemporary Art, Los Angeles, the Dallas Museum of Art, the Rose Art Museum, the Metropolitan Museum of Art, and the Museum of Modern Art—have acquired pictures in recent years. Sam Gilliam, Whirlirama (1970). Photograph by Fredrik Nilsen. The Met, for example, owns two major Gilliams. It acquired Whirlirama (above) from Kordansky in 2014. It bought the other, Leah’s Renoir (1979), the year it was made—a testament to the artist’s long track record of institutional interest. Roxanne Cohen, director of art advisory at Pall Mall Partners, notes that market interest in the artist coincided with a shift away from young, emerging painters whose prices eclipsed those of Gilliam during the recent art-market boom. Installation view of “Sam Gilliam : 1967–1973” at Mnuchin Gallery. Photography Tom Powel Imaging. Artwork © Sam Gilliam. Gilliam was born in Tupelo, Mississippi, in 1933, the seventh of eight children. He began painting when he was in elementary school and graduated from the University of Louisville in 1955. After serving in the US Army in the late ’50s, he completed his MFA in 1961. He has lived in Washington, DC, since 1962. After making his name with the drape and slice paintings, his approach changed dramatically in the 1980s, when he began adding multiple layers of thick acrylic paint to the canvas. These so-called “quilt” paintings involved cutting geometric shapes from the encrusted surface and rearranging them in patterns reminiscent of the African American patchwork quilts he remembered from his childhood. For those who have followed his career for decades, this latest embrace of Gilliam’s full body of work is already overdue.